The name of this Christmas cake can be confusing to English speakers, but the word Pascua refers to both Easter and Christmas in Spanish. Pan de Pascua is thought to have evolved from two other holiday breads, German stollen and Italian panettone. 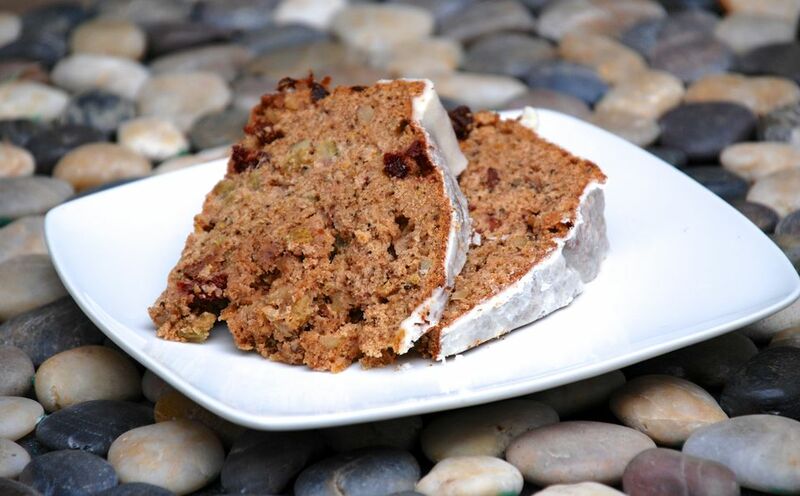 It's a rich, dense spice cake, flavored with rum (or pisco) and filled with dried fruits and nuts. Serve Pan de Pascua with the spiced alcoholic coffee concoction called cola de mono (tail of a monkey), another Chilean holiday tradition. Although not traditional, this cake would be delicious covered in marzipan. Cream butter with the sugars until smooth and creamy. Add eggs one at a time until well blended. Sift the dry ingredients together. Stir the fruit zests into the dry ingredients. Whisk the coffee, brandy or rum, evaporated milk, anise flavoring, vanilla, and vinegar together. Alternate adding the wet and dry ingredients to the butter/egg mixture, blending well. Fold in the nuts and the dried fruit. Line the bottom of a 9-inch springform pan with a circle of wax paper. Spread the batter evenly into the pan. Bake the cake for 45 minutes. Without removing the cake from the oven, carefully sprinkle some sifted powdered sugar over the top of the cake, then bake the cake for 15 minutes more. Check cake for doneness: a wooden skewer inserted into the middle of the cake should come out clean. If the cake is not yet done, return it to the oven and check it again every 5 or 10 minutes until done. Let cake cool 15 minutes in the pan on a rack. While the cake is cooling, make the icing. Sift 1 cup confectioner's sugar into a bowl. Add melted butter, a pinch of salt, and 1/2 teaspoon vanilla. Stir in 1 - 2 tablespoons milk or more to reach desired consistency. Remove cake from pan, and drizzle top with icing. Cake keeps for up to two weeks in the refrigerator, wrapped in plastic.